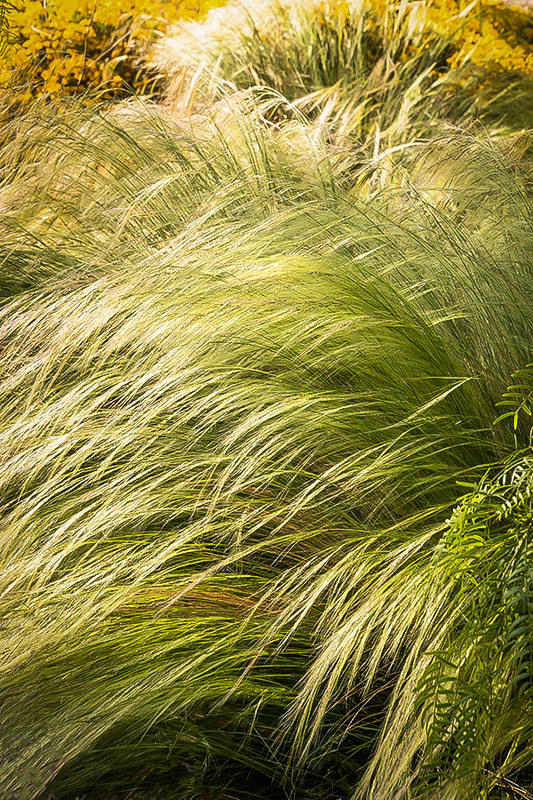 Mexican Feather Grass has the finest foliage of any ornamental grass. It forms soft plumes of hair-like silvery-green leaves, that sway gracefully in the slightest breeze. This grass grows a little over 2 feet tall and has feathery beige sprays of seed-heads from mid-summer into winter. It looks especially beautiful in fall, and it fits well with fall-blooming plants. It grows from Zone 6 and warmer, thriving in full sun, and even in poor, dry soils. This is the ideal choice for low-maintenance gardens, and natural cottage gardens too. It looks perfect in containers and pots, with or without flowers added. There is a calming beauty about grasses that is relaxing to look at, even in the simplest planting arrangement. Plant this grass in clumps or drifts and watch it sway and billow in the breeze, like ocean waves. You can easily grow Mexican Feather Grass in any sunny spot. 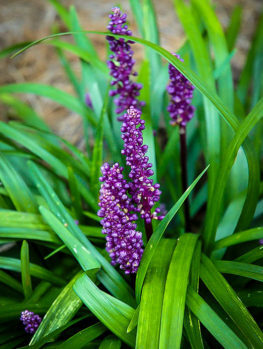 It prefers drier, well-drained soils, including sandy soil, and it is easy to care for – just trim back to a couple of inches tall in early spring, before new growth begins. It is not eaten by rabbits or deer, so you can grow it at a cottage, or in any natural style of garden. It has no pests or diseases either. In Zones 9 and 10 this grass has been known to invade natural areas and pastureland, so grow instead Dwarf Fountain Grass. 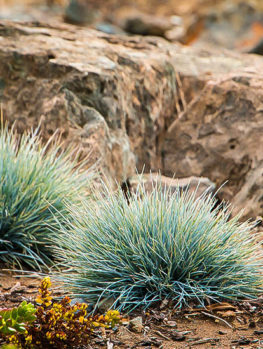 Ornamental grasses come in many forms – some are large, with bold foliage, while others are smaller. Some have very fine leaves, making a soft, feathery effect, and Mexican Feather Grass is the top-pick of this type, with its fine, soft foliage creating a delicate look – although in fact it is a tough, easy to grow plant. 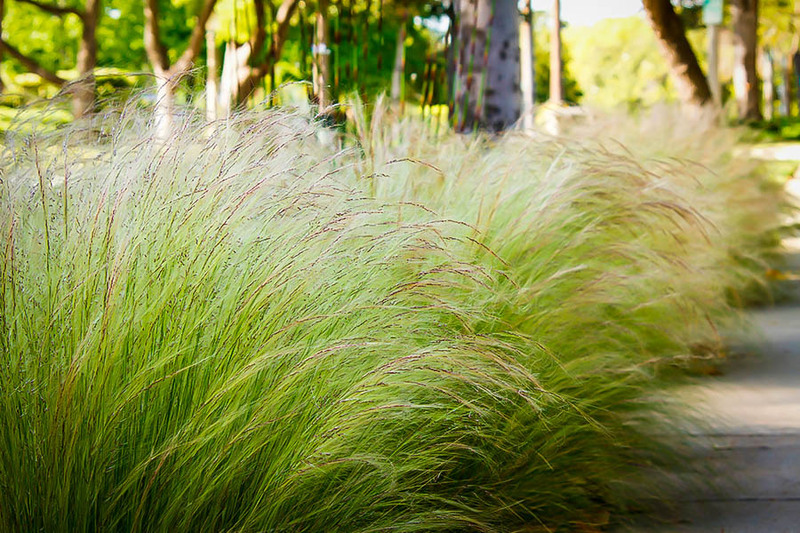 This is a beautiful grass with a graceful, airy look, and it is also drought-resistant and thrives in drier areas. Problems with this grass in Australia do not apply in most of the USA, since this grass already existed as part of our native flora. 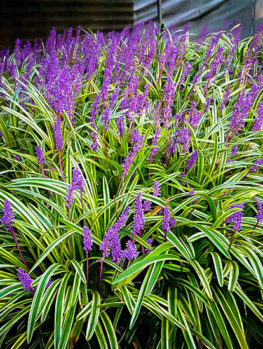 For cooler regions, this grass is perfectly safe, and all gardeners love the soft, flowing look at this plant. Our stocks are limited, so order this popular grass now, while stocks last. 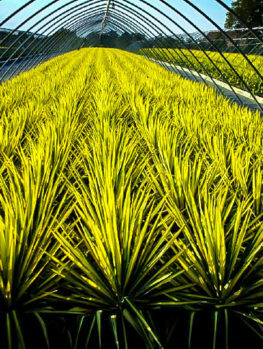 Mexican Feather Grass grows into an upright clump of very fine, narrow leaves that are almost thread-like. They are a silvery green color, and spout upwards and then outwards in a cascading fashion. They grow to about 2 feet high, and 18 inches across, swaying in even a gentle breeze, and bringing life and movement to your garden. In summer, flower stems rise 6 to 12 inches above the foliage in creamy-white feathery plumes. The overall effect is very airy, yet the clumps are dense, so it also fills the spaces in your beds well. 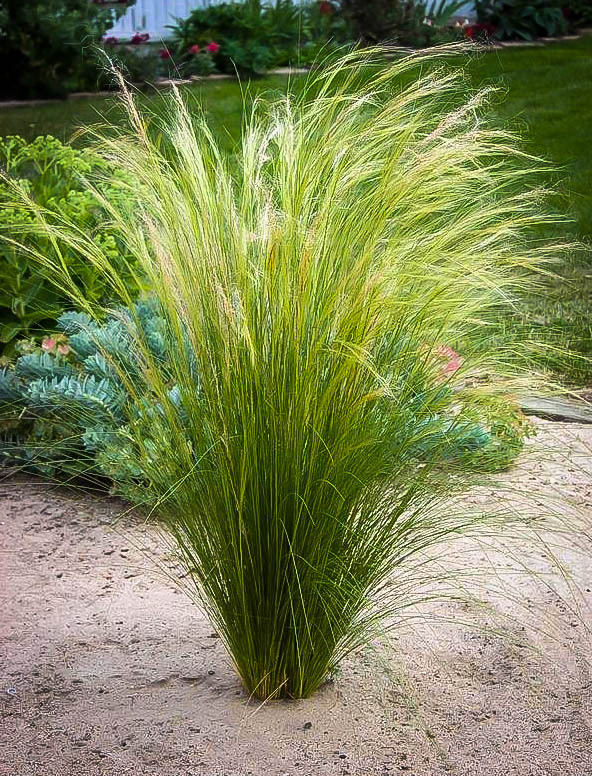 Mexican Feather Grass grows well in hot, dry, sunny places, and it is a perfect choice for a sunny bank, or for planting in front of shrubs in a sunny bed. 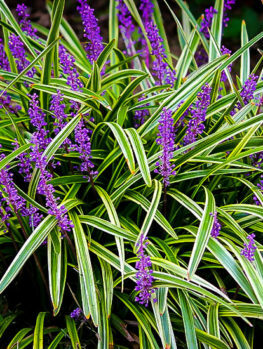 It is also a very useful and attractive grass for planters and pots, where it brings height without looking heavy. Place them in groups or drifts as a groundcover plant, or mix it with perennial flowers, especially later-flowering kinds, like Sedum or Asters. It looks lovely in a cottage-style garden, or in more formal settings. 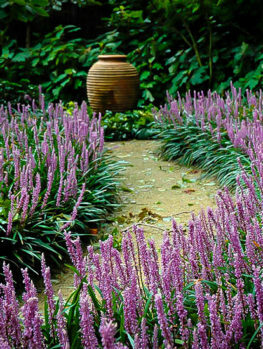 It is also a great choice for low-maintenance natural and xeric gardens. It is drought resistant, needing very little care, and in suitable places it will grow from is own self-sown seeds, naturally filling empty areas for you. 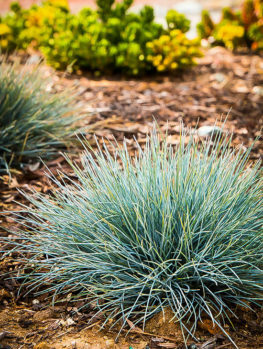 Mixed with other, easily-grown plants, and ornamental grasses, this is a very easy way to turn a hot, dusty, part of your garden into an attractive picture. These natural grassy areas should be mowed once a year, in winter, at the highest setting. Remove the clippings, and do not use fertilizer, as that will encourage coarser plants to move in to the area. This grass grows in all but the coldest regions, being hardy from zone 6 all the way to zone 10. It grows best in full sun, and in any well-drained soil, even dry sandy soils. It is an ideal choice for sloping sites and banks, where the roots will stabilize the soil, and the grass will grow well in the drier soil. 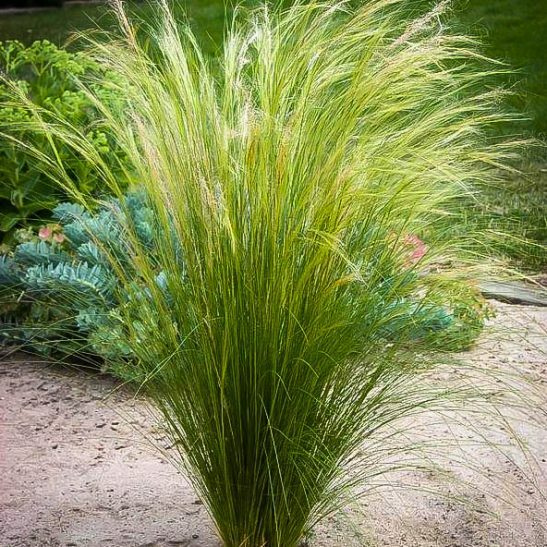 If you have wetter soil this grass will not grow so well, so choose Karl Foerster Feather Reed Grass instead – that grass is taller, but also has fine foliage, and thrives in damp to wet soils. Mexican Feather Grass is easy to grow, and it is usually not eaten by rabbits or deer. It has no pests or diseases, and it grows into dense clumps that stay where you put them. It does not spread by the roots, but it does sometimes spread from seed, so remove seedlings you do not want before they mature. The only care needed is an annual ‘hair-cut’. These is best done in early spring, before new growth appears. Cut the foliage back to 2-3 inches above the ground and new growth will quickly appear, making your plants look fresh and new again. In fall the foliage will turn a soft, sandy-brown color, which is attractive all winter. If you wish to, you can also cut back in late fall. Mexican Feather Grass, Nassella tenuissima, is native to Mexico, Argentina, west Texas and southern New Mexico. It is sometimes described under an older name, Stipa tenuissima. 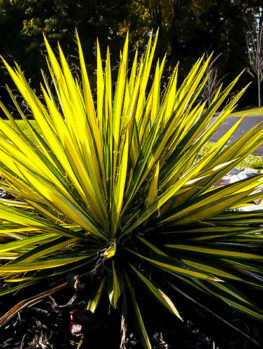 It grows in dry areas, alongside other grasses and drought-resistant plants. In zones 9 and 10 this grass is not recommended because it grows too fast, producing too many seeds, and spreading inside and outside the garden, sometimes invading natural areas and pasture land. Mexican Feather Grass is also a poor plant for grazing animals to eat, so the quality of pasture deteriorates. If you live in these hotter zones, such as California, and you are looking for a fine-foliage grass with a similar appearance, we recommend that you plant Dwarf Fountain Grass (Pennisetum alopecuroides ‘Hameln’) instead.